The question of whether electric toothbrushes can get wet is a question that is asked quite frequently. So, can they get wet? Yes, as a general rule you can get an electric toothbrush wet. But, let’s be very clear that there is a difference between a rinse under the tap and complete immersion in under the bath water for example. The conditions can also vary from brand to brand and even model to model. Water and electronics do not really go hand in hand. In fact together they can be quite dangerous. It is for this reason, that electric toothbrushes and electric shavers that are normally used within a bathroom have a 2 pin connector, different to the normal 3 pin connector we have in homes in the UK. It is all to do with safety. We explain this in quite some detail in another post on our site, 2 pin plug adapters for toothbrushes explained. There is a very clear difference between water resistant and waterproof. According to Google’s definition of waterpoof is defined as “impervious to water” whereas water resistant is “able to resist the penetration of water to some degree but not entirely”. It is this latter category of water resistance that most electric toothbrushes fall into. This means that they will withstand exposure to water for long periods of time and frequently, but potentially at some point the water may get into and may damage the toothbrush, often rendering it useless. There is something referred to as an IP rating that is a scale by with a product is tested and rated to. A great explanation is offered by the Enclosure Company. 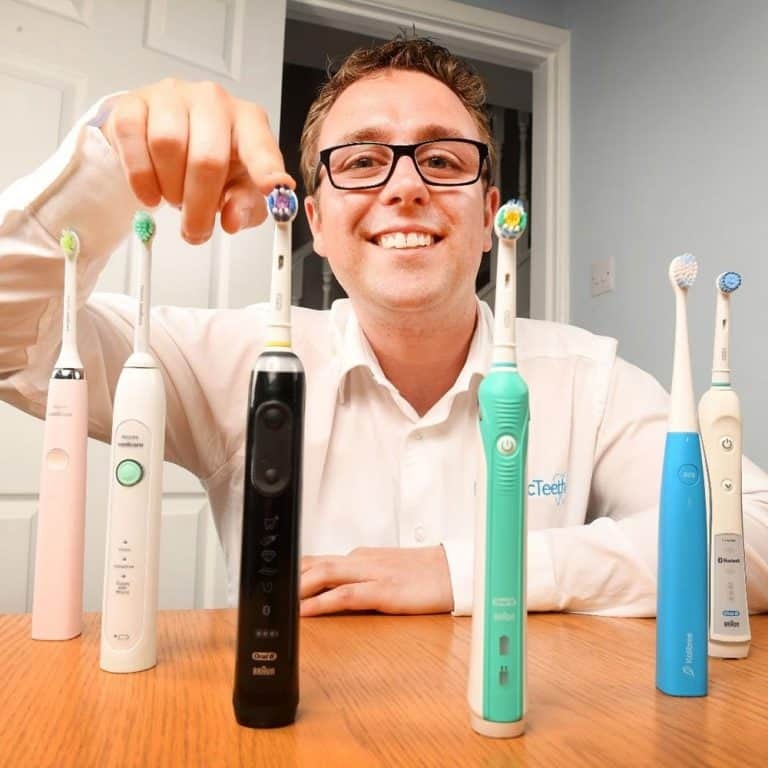 For most toothbrushes an IP rating is not really necessary, or if it conforms to such this is not something that is actively publicised. The water resistance applies to the brush handle and brush head and not the charging stand or related charging accessories. Always avoid these coming into contact with water. They may be cleaned with a damp cloth, but ensure they are disconnected before doing so. What do the manufacturers say? The following wording has been taken from the manufacturers websites and user manuals to give a clear indication on the manufacturer’s recommendations. Do not place the charger in water, liquid or store it where it can fall or be pulled into a tub or sink. Do not reach for it if it has fallen into water. Unplug immediately. Do not touch the power plug with wet hands. This can cause an electric shock. After brushing rinse your brush head carefully under running water for some seconds with the handle switched on. Switch off the handle and remove the brush head. Clean both parts separately under running water then wipe them dry before reassembling the toothbrush. Disassemble charging unit before cleaning. Never place the charger in dishwasher or water; it should be cleaned with a damp cloth only. Brush head holder, brush head compartment and protective cover are dishwasher safe. Subject to change without notice. Keep the plugged in charging base away from water. Do not place or store it over or near water contained in a bathtub, washbasin etc. Do not immerse the charging base or travel case in water or any other liquid. After cleaning, make sure the charging base or charging travel case is completely dry before you connect it to the mains. Do not use your toothbrush in the bath or shower. Do not clean the brush head in the dishwasher. Clean the Sonicare periodically. Rinse the handle and the brush head. Wipe down all surfaces with a soft cloth and mild soap, if desired. Do not use sharp objects to clean. Only the charger glass is top rack dishwasher safe. Do not clean the brush head, handle, charging base or charging travel case in the dishwasher. The Colgate ProClinical electric toothbrush is water resistant, but not waterproof. We do not recommend using the electric toothbrush in the shower. Do not place or store product where it can fall or be pulled into a tub or sink. Do not reach for a product that has fallen into water. Unplug immediately. Do not touch the AC adapter with wet hands. AC adapters should always be completely dry when connecting to power. As you can probably tell, the information is consistent in that the brushes are water resistant and can be rinsed under water but should not be immersed in water. Can I use my electric toothbrush in the shower? From my research, both Philips Sonicare and Colgate explicitly say that you should not. I have not come across such from Oral-B, but good practice would be to follow what the other brands are doing and avoid doing this. That said, the majority of brushes are water resistant and can be rinsed under water, so the use within a shower is usually fine. You do this however at your own risk. Potentially use in the shower could invalidate the warranty, but it would be very unlikely to become an issue unless they could prove you did this. DO NOT take or use the charging base or associated charging accessories in the shower. If you are going to do this, use only the brush handle and head. Can I immerse my brush in water? For example put it in the bath? No. On no account is this advised. Should it be it may stop working and could potentially give an electric shock. My electric toothbrush has removable batteries can it still get wet? Yes, normally this is fine. The seals on a compartment for removable batteries are generally robust but are perhaps more prone to damage than those brushes with built in batteries, so always be careful and do check the condition of seals. If at all concerned, avoid immersion in water. Use the likes of a damp cloth to clean off. Can I get an electric shock from using the toothbrush in water? Potentially yes, but the chances are very very slim. As I have explained most brushes are water resistant and will generally not allow the electronics to get wet, but it could happen, if seals fail or the brush is damaged in any way. Should this happen, the resulting electric shock is unlikely to be too severe. The voltage of the batteries, be those removable or internal are quite low and is less likely to cause serious injury if a shock should occur. But, circumstances and people can react differently, so be cautious. Is my toothbrush water resistant? The likelihood is yes as has been explained throughout this article. However conditions can vary between brands and specific models. Therefore it is always worth checking with the manufacturer and taking their advice. Can I clean my toothbrush with water? As per the wording from the brush manufacturers it is fine to rinse your toothbrush (handle and head) under water and in many cases use a cloth and mild soap too. Do not wash or rinse any of the charging appliances under water. For more directions on how best to clean your brush, you can refer to our post how to clean your electric toothbrush. Have I missed something out? Got something that you want added to this article? Had a good or bad experience with water and a toothbrush? Please do leave any comments below, they are most welcome. The top part of my toothbrush – the metal spike that the brush head fits on to – frequently gets wet after I’ve removed the brush head. I’m worried about CHARGING the brush in that condition. I do wipe it several times with a dry towel, but it still seems wet, as when I turn the brush back on, some droplets still appear at the end of that metal spike. Can I still CHARGE it? It’s an OralB. As far as I am aware that is fine Deirdre, no need to worry about it.